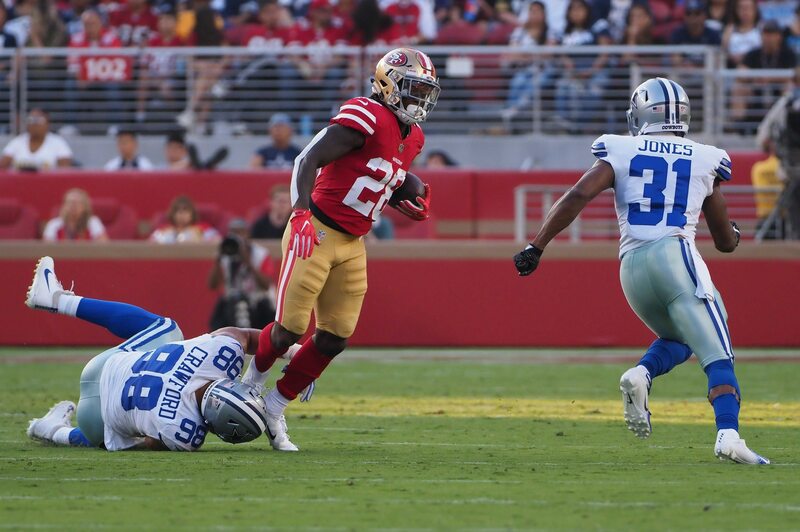 The San Francisco 49ers were hit with the injury bug in their first preseason game, and then their bad luck continued Sunday as Jerrick McKinnon suffered a knee injury. Nick Wagoner of ESPN reported it is a right knee injury that will require an MRI. Per #49ers, RB Jerick McKinnon has a right knee injury. He's going for an MRI. This is obviously something that will cause 49ers fans and those in the front office to hold their breath. McKinnon was one of the team’s prized free-agent acquisitions this spring, and he figures to be a huge part of Kyle Shanahan’s offense this year. Last year as a member of the Minnesota Vikings, McKinnon totaled 991 yards and five touchdowns from scrimmage.